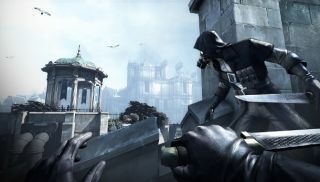 On the strength of this trailer, we can be fairly certain that The Knife of Dunwall, the second piece of Dishonored DLC, is going to live up to its name. In fact, for a man trying to forget what he's done to the Empress, Daud seems to be going about it a in a funny way: doing what he did to her to everyone else. A guard? Stab him! A man with a top hat? Stab him! Another guard? Summon an assassin to stab him! The Outsider? Stand around while he tediously waffles about nothing. Oh well, you can't always stab what you want. Daud's road to atonement might be questionable, but this mini-campaign looks like an enjoyable return to Dunwall. There are new districts to explore, a tweaked ability set to play with, and new enemy types to tackle. You can read more about what to expect in Tom Senior's hands-on preview . The Knife of Dunwall is due out April 16th, and will cost £7.99.